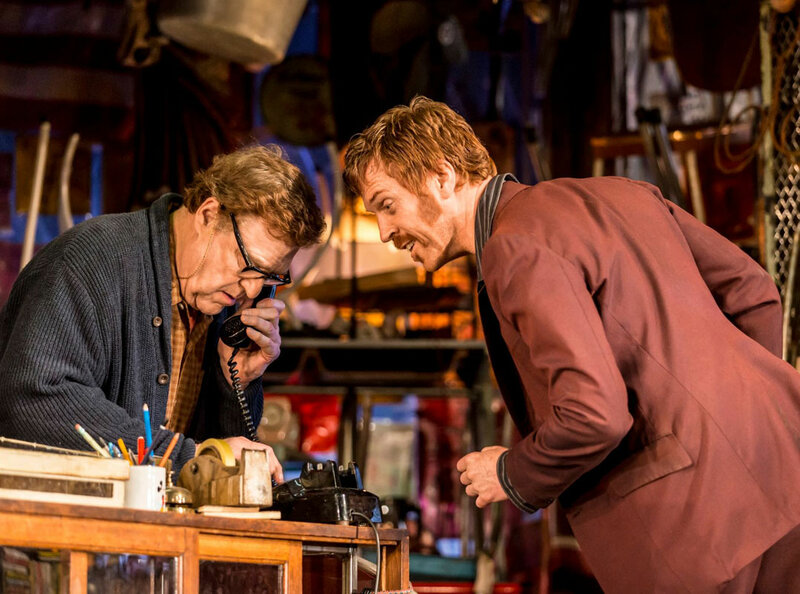 Damien Lewis stands there, cocksure, like John Travolta in Saturday Night Fever, one foot forward, a chip on his shoulder as broad as his bell-bottoms. He stands there, upright, with his slimeball swagger and his sense of grievance. Then he fires those bullets of words, unmistakable David Mamet words, that are terse and violent but as textured as a sirloin steak. And you know, in your gut, this is a moment. Two surefire stars (Damien Lewis as Teach and John Goodman as Don), Mamet at his snarling best (well, up there) and two hours of this fizzing to and fro as the low-rent hucksters botch their small shot at the big-time. Then there’s Tom Sturridge, third point of this very pointed triangle. He brings some empathy in his role as druggie Bob. The other two go at each other all the time, over everything, bickering and snarling but there’s a comic rhythm to their patter, like the Marx Brothers, or Itchy and Scratchy with frying pans. Bob, two steps and many IQ points behind, slows the action to create space for some humanity. He has Don’s sympathy which means he has Teach’s enmity. The story is slight and full of slights. Junk shop owner Don (inhabiting Paul Wills’ crowded, claustrophobic set) thinks he was ripped off over a rare nickel. Teach, bristling with electric fury over life’s indignities, wants to muscle in on Don and Bob’s plot to right the wrong. The three small-time hustlers feud over a coin, like three bald men and a comb. Loyalties sever and heal, and tension builds till it spills over into something more distasteful forcing revelations that dip beneath the swagger and self-righteousness. Damien Lewis, who holds together the piece, is a scream. He channels the “hoo-hah” of Al Pacino and the “you looking at me” of Robert De Niro to create a tragi-comic character of Teach. It’s a physical performance, very stylised (under Daniel Evans’ taut direction) and he’s forever prowling and marching and shooting ramrod poses like he’s on the movie poster of some 70s camp crime caper. John Goodman, in contrast, is hangdog sloppy, zoned out half the time in his drooping cardy, and his specs on a string. But he has the Roseanne hard yards so he can bark and bite when provoked. And he gets especially worked up over Bob (possibly a homosexual crush), with Tom Sturridge playing the boy as a wiry, emotionally zonked stoner who can’t quite figure out the hot and cold of Don’s destructive passions. This is a frothing, buzzing foul-mouthed masterclass from Mamet and his three stars, capturing the flip-side of the American Dream in a world gone sour post-Watergate. Add to list labelled “Must-See (And Quickly)”.